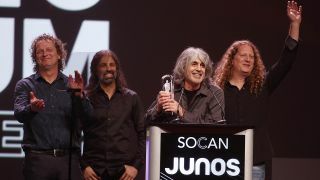 Voivod are celebrating after winning their very first Juno Award in their homeland of Canada. The band had been nominated in 1991 for Nothingface and again in 1993 for Angel Rat – but it was third time lucky as they came top of the Metal/Hard Music Album Of The Year category for 2018’s The Wake. Drummer Michel ‘Away’ Langevin says: “We are still floating from winning our very first Juno, for our new album The Wake. It is the best source of energy to get ready for the upcoming North American tour with YOB and Amenra. Watch video footage of Voivod picking up the award at the gala dinner below. Other artists from the rock world to win Junos in the past include Devin Townsend, Kataklysm and Rush. Voivod's European tour will get under way in August, with the band adding a further five German shows to the previously announced dates.